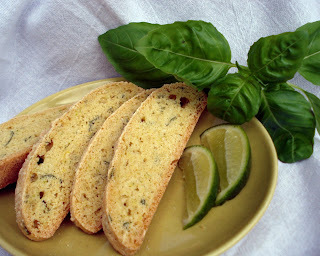 Yep...I'm continuing my herb cookie craze with Biscotti this time. 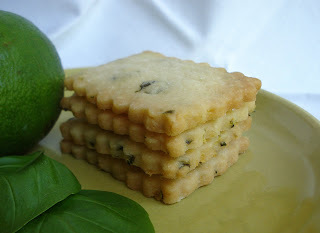 A few posts ago I made Lime Basil Shortbread Cookies and I got to thinking about this combo with Biscotti. I mean, what the heck, I just made Lavender Honey Biscotti and that turned out very good so I figured I'd give this a try! The lime flavor is very subtle , so far, but maybe by tomorrow it should be even more intense. The basil flavor doesn't really come through much. You could make it more "limey" by drizzling the biscotti with a lime glaze made from a little lime juice mixed with confectioners sugar. So, give it a try for a new twist on Biscotti...call it Summertime Biscotti...or something ...whatever!! ( This Biscotti recipe, you may notice, does not use any butter or oil so it has a wonderful "crunch"). In a large bowl whisk flour,baking soda,baking powder,salt. Add basil and set aside. In large mixing bowl, beat eggs and gradually add sugar til mixture is smooth and fluffy. Beat in vanilla and add lime zest and mix til just combined. With mixer on low, stir in flour mixture and mix til just combined. Shape log (s) with damp fingers. Sprinkle tops with "lime sugar". Bake for approx. 25 min. ( or until log springs back when touched with finger). Let cool about 10 minutes. On cutting board, slice log(s) and place slices back on baking sheet. Bake about6- 7 minutes, turn slices over and bake other side another6- 7 minutes. Cool on wire cooling racks. Store in air tight container. Try with some cool, creamy ice cream or sorbet!! Yum!! I found these wonderful Apricot Rosemary Cookies and made them one day last week. They came out great but I felt they were too thick so I made them again today and rolled them out thinner and they were just perfect. The cookie is made with a little bit of cornmeal in the batter which makes it taste more like a cracker than a cookie. At one of the farmers markets where I set up there is a vendor who sells delicious and unusual flavors of homemade jams and jellies. 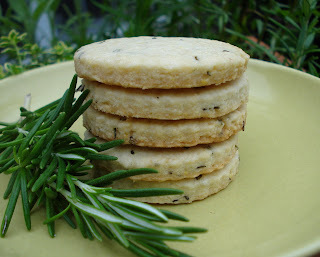 She had a jelly with rosemary in it and we put the Rosemary cookie with it and ..Wow!!.. it was awesome!! So, I suggest you give this recipe a try!! Well, here it is another bakeathon Friday, with 3 markets to bake for this weekend...(the weatherman better be right about it being a sunny one!! ), and I decide, once again, to do a comparison of my blondie recipe vs. America's Test Kitchen blondie. I don't really know why I pick the busiest day to do this...or, for that matter, why I even do this at all!! I guess I think maybe there's a better recipe than the one I'm using out there and I need to know !! But anyway, here goes. The 2 recipes are very similar. The ATK recipe. uses almost the same ingredients but different amounts than mine. Where I put in butterscotch chips, semi sweet chips,pecans and toasted coconut, they only put in semi sweet chocolate chips , pecans and white chocolate chips. They use 2 whole eggs and I use one whole egg and one egg yolk. I will say that I like the fact that theirs makes quite a lot more blondie than mine. I bake mine in a 8 x 8" pan and theirs is baked in a 9 x 13" pan so with a little more amounts, theirs makes more. As you can see in the photos, they both look almost identical.And...drumroll please...the taste...even though mine was much sweeter, the addition of butterscotch chips gave it more flavor so I still like mine better. So I'm thinking... their recipe with more stuff in it!! Sounds good to me! Butter and line bottom with parchment paper a 8 "x 8" pan. Set aside. In small bowl combine flour, baking soda, baking powder and salt. Set aside. In a large bowl, whisk butter and sugar. Add egg, yolk, vanilla and whisk til combined. Add flour mixture to butter mixture with spatula and stir til just combined. Add chips, pecans, coconut and butterscotch chips and just gently stir to combine. Pour into prepared pan and smooth out with spatula or knife. Bake at 350 for 23 - 25 minutes, or til toothpick comes out clean. Cool completely in pan ( at the least one hour) and turn out onto cutting board. Cut to desired sizes. Lately I've been kicking around some interesting flavors for my shortbread cookies. Last month as I was sitting in my friend Janet's car at the antique show in Brimfield,( taking a break from walking the fields...whew! !...I'm still tired from all that walking!!) I noticed she had a stack of magazines, so I looked through some of them and came upon this recipe. I guess, as the summer is almost officially here, I'm inspired to use some fresh herbs in my baking and this recipe sounded so great! How could you miss with basil and lime?! I love making shortbread cookies for several reasons. First, they are so buttery and just so very yummy!! And second, they are great, in my humble opinion, to bake because you can make the dough ahead and refridgerate and use when you'd like. And lastly, once baked, shortbread has a longer shelf life than most other cookies because they just improve in flavor with time ( just be sure to keep in an air tight container )...so what's not to like!?? So...here's the recipe. Lime sugar for sprinkling on top of cookies before baking. ( Lime zest mixed with sugar). Cream the butter and sugar til light and fluffy. Beat in the vanilla and salt. In a small bowl, toss flour, basil and lime zest. With mixer on low speed, add the flour mixture to the butter mixture til it forms a ball. Wrap dough in plastic wrap and refridgerate at least 2 hours. Once dough is out of fridge for a little while and has softened a bit, roll on lightly floured surface ( I roll out between 2 pieces of plastic wrap ). Roll out to about 1/4" thickness. (If dough is too sticky, you can always put it back in the fridge to chill a bit.) Cut out desired shapes and place on parchment lined sheet. Sprinkle with lime zest sugar. Bake approx. 10 minutes ( mine took a bit longer so watch for edges to be slightly browned). They do get better flavor the next day. Perfect with some refreshing lime sorbet!! Yum! !